truck and horse trailer. Start at $9.99. FREE Shipping Available. Look for this Logo at your favorite online store to make sure you are purchasing our quality products. DO YOU HAVE YOUR LIGHTS ON?! 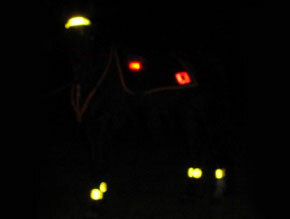 These Leg Lights are used by Mounted Police Units. 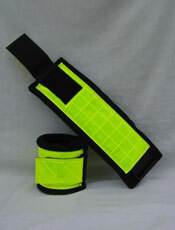 Size: 4" W x 11 1/2" L. Velcro closure for easy removal. Yellow reflective on black syn-felt. Velcro closure for easy removal. Yellow reflective on black syn-felt. Fits over 1" brow band/strap. 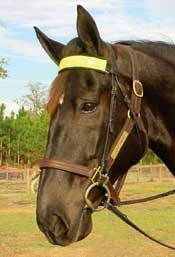 Size: 1 1/2" W x 18" L. Velcro closure for easy removal. Yellow reflective on black syn-felt. Size: 3" W x 12" L. Velcro closure for easy removal. 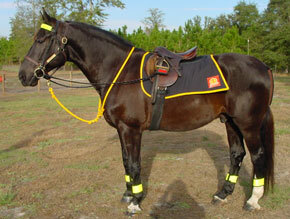 Yellow reflective on black syn-felt. Copyright � 2000 - All rights reserved. No part of this site may be reproduced in any way without written permission from Needlepoint Farm, Inc. [email protected]. Needlepoint Farm, Inc. Web Site Design & Development by Webmaster for Hire.